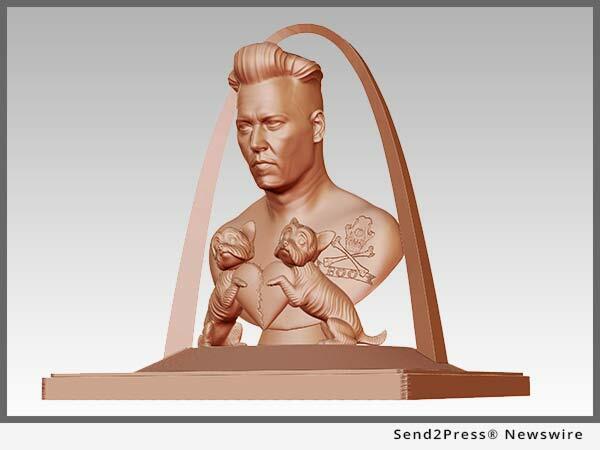 ST. PETERSBURG, Fla., Jun 29, 2016 (SEND2PRESS NEWSWIRE) -- Teen sculptor Rodman Edwards has created a statue of Johnny Depp and his dogs in the midst of the actor's divorce proceedings with wife Amber Heard, portraying the actor as winning custody of their dogs. The sculpture, shown with saddened dogs, is being unveiled by Cory Allen Contemporary Art in St. Petersburg, Florida in August. The statue, titled "Depp Wins Custody of Pistol and Boo," depicts a likeness of Johnny Depp under a doghouse archway, sporting his current Dillinger-inspired hairstyle, while modeling Pirate-like "Yorky" skull and crossbones tattoos of his dogs Pistol and Boo, which are also represented in statues, tearful, cowering and holding pieces of a broken heart. After filing for divorce from Depp, claiming domestic abuse, Heard is asking for Pistol, while Depp is battling to keep both dogs from being divided. Last year, Heard neglected claiming their two Yorkshire terriers with customs. The Australian government viewed the incident as attempting smuggling, threatening to euthanize the dogs. "After a whole year worrying about Pistol and Boo's fate, concern for their well-being isn't over. The latest Johnny Depp divorce complicates a safe custody of Pistol and Boo," said artist Rodman Edwards. "They deserve an owner who can make them feel safe and happy." "People in troubled marriages are able to speak to defend themselves, but animals - beloved pets like Pistol and Boo - have no such recourse," said the artist's spokesman Cory Allen. Rodman Edwards, featured in Complex Magazine's list of "20 Best Artists Under 20 Right Now," is previously known for his portrait of Bill Cosby in "Fat Albert Cries for Dr. Huxtable." Edwards, a junior in high school, has shown his work at Monsterpalooza in Pasadena, Mask Fest in Indianapolis, and Copro Gallery in Santa Monica. His large mask of Hillary Clinton was displayed during an anti-Keystone pipeline demonstration at a democratic fundraiser attended by Clinton in San Francisco. "Depp Wins Custody of Pistol and Boo" opens to the public at NOVA 535, Saint Pete's #1 Unique Event Space, located at 535 Dr. Martin Luther King Jr. St N. Saint Petersburg, Florida in August. Contact Cory Allen at 323-393-3115 or visit http://www.cacanet.com/. *Caption: "Depp Wins Custody of Pistol and Boo," by Rodman Edwards.